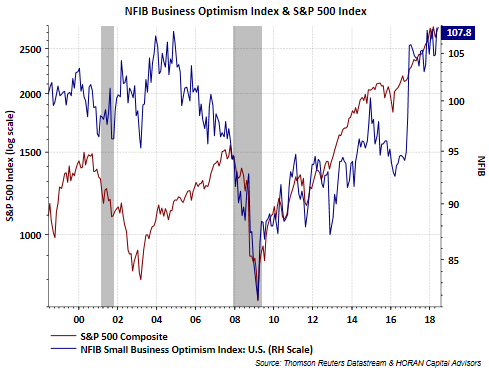 Today, the National Federation of Independent Business (NFIB) reported the May Small Business Optimism Index increased to the second highest level in the survey's 45-year history. The May reading increased 2.6 points versus the April reading and exceeded the high end of the consensus range. "the rise in optimism among small business owners was broad-based, with 8 of the 10 components of the index showing improvement. Contributing to the overall gain were plans to increase inventories, which rose 3 points to a net 4 percent, earnings trends, rising 4 points to net 3 percent and a survey record, plans to make capital outlays, up 1 point to a net 30 percent, and expected credit conditions, which rose 1 point but remained negative at a net minus 5 percent." Four out of last seven highest NFIB readings have occurred in the last eighteen months. 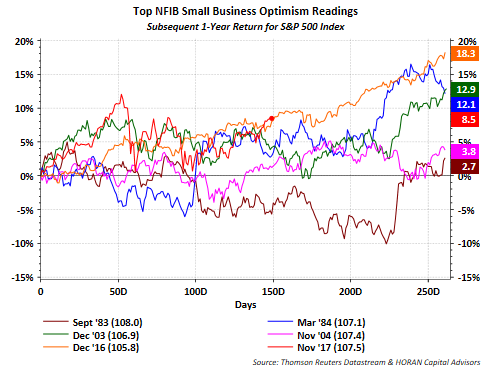 As the below chart shows, historically, 1-year subsequent returns for the S&P 500 Index have generally been strong following high levels of small business optimism. Going forward I will include tracking of the equity market's performance based on this new high reading as well.